I don't care how people vote, or who they support. I do care about correcting revisionist history. Gun advocates listen closely to what gun-controllers say, and how they say it, because they care more about the consequences of what the speaker is going to try to do. On top of it, they have an understanding of the terms and technology that the gun-controllers do not (so they hear a lot more in terms or misuse of them than the gun controllers even fathom). By listening to Obama speak, they knew Obama was looking for an opportunity to oppress the liberties of gun owners, in what he said and how he says it. 2.1 Fraud #1: "30,000 die because of guns". His speech brought him to tears. 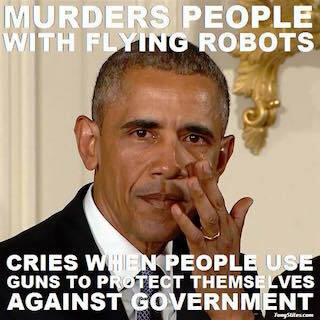 Oh the humanity.... from a man that uses robots to bomb thousands on foreign soil, but a few Americans due to his failed security policies (domestic and foreign) makes him cry, and blame innocent gun owners that had nothing at all to do with it. He mentioned Fort Hood, SandyHook, Binghamton, Aurora -- all long before he was President. 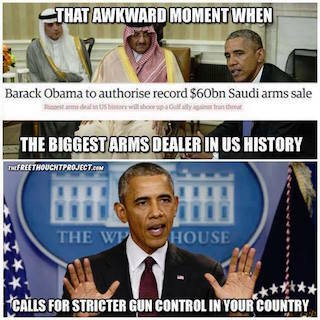 He ignored bigger massacres in countries with gun control, during his tenure. Then he whined about Oak Creek, Newtown, The Navy Yard, Santa Barbara, Charleston, San Bernardino, Gabby Giffords. All with guns that not one of his new proposals would have addressed. And he ignored the innocents that would be hurt by his policies. And you wonder why civil rights defenders aren't fans of his? His biggest complaint (and deception) was in this whole Gun-show/Internet “loophole”. There is no real gun-show or Internet "loophole". There are a few transactions happening that aren't as regulated as the left would like -- but this is like saying that we need to block all the commerce tax/regulation loopholes like: garage sales, getting given a drink/cigarette at a friends house, freecycling (where you sell/trade items you don't need/want), and or neighbor kid washing your car, selling lemonade or mowing your lawn. Where are the W-2 or 10-99’s? Oh the lost tax revenues are destroying us! It misses completely for those who know what they're talking about, but that's not his base. As exemplified by the number of deceptions/frauds (misleading half-truths), lies (complete falsehoods), and errors (mistruths that he may be too ignorant to realize, despite having hundreds correcting him for decades on it). Fraud #1: "30,000 die because of guns". Only polemics and rubes quote 30,000. Gun deaths are about 8,124 murders. Then he's throwing in 22,000 suicides, but America has a lower suicide rate than many countries like Japan or Finland with strict gun-control. No one has ever shown evidence that guns increase suicide rates, despite decades of lefties trying. Thus, they didn't die because of guns, they died because they're suicidal or mental health issues. So if you have to start with a fraud, you're not very honest, and going to polarize the informed against you. His base cheered, everyone with a clue groaned. "we are the only advanced country on Earth that sees this kind of mass violence.... erupt with this kind of frequency. It doesn’t happen in other advanced countries. It’s not even close. " We are also the only advanced country that's put a man on the moon, invented the Internet, or that does over half the world's medical R&D, and subsidizes other countries national defense, and so on. So we could correlate completely unlike things, as he does. But I'll ignore the big stupidity, and just pick nits with the little ones. Even if he was right, that would just be another way of saying, "liberty comes with a price”. But of course he's not right. We're not the worst. We're actually fairly low on the list even in OECD countries, but that's cherry picking data. Read [U.S. vs World - Crime/Murder] and it lays out that we're middle of the pack in murder rates. And low for countries in our hemisphere. And we have some of the largest aggravators of violence (which is cultural diversity and mixing). If you adjust for race, we're way better than Europe. The frequency of mass shootings has spiked under his administration, because he and the media keeps drawing attention to them (that encourages copycats). Still, the biggest mass shootings happen in places with gun control (Norway, Russia, Germany, France, etc). And mass murder by bomb or vehicles, is higher in Europe as well. What we've known for 40 years, is that when you televise mass shootings and draw attention to them, you get more of them. Which is why his administration has gotten more than the prior 2 or 4 combined (depending on where you put the thresholds). 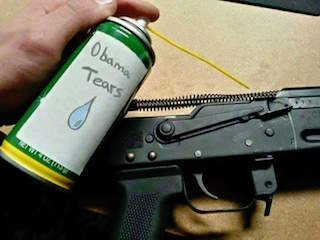 Obama's crocodile tears, and giving as much attention as he can, is lubrication for future copy-cats. He either knows this, and doesn't care, or he's and his entire administration are ignorant of the basics of the topic he's speaking on. And his base, gobbles it up. If the truly cared about the victims, they'd ask why these events have gone up, spend the time researching the topic, and then being embarrassed by his actions of ghoulishly preying on the victims for political gain. "we’re here today. Not to debate the last mass shooting, but to do something to try to prevent the next one"
And that's why he's announcing gun control laws that would NOT have stopped ANY of the past mass shooters he mentioned? Not one of his recommendations would have stopped any of the cases he pointed to as a problem. How does that make sense to anyone that's informed on the topic? Plus we know that's a lie, if he cared about mass shootings he wouldn't draw attention to them, he'd pass these as quietly as possible. He cares about not letting a political opportunity go to waste to draw attention to himself, and vilify his opposition (the informed and innocent gun owners). "We all believe in the First Amendment, the guarantee of free speech, but we accept that you can’t yell “fire” in a theater. We understand there are some constraints on our freedom in order to protect innocent people." Comparing 1st and 2nd Amendment dishonestly? Sure, yelling fire (and trying to hurt people / incite pandemonium) is against the law, so is murdering someone with a gun. His implication is that those who oppose him on this, would have a problem with the “Oliver Wendel Holmes invented ‘fire’ standard”. First, let's remember that the "Fire in a crowded theater" excuse was invented by a progressive/fascist judge (Oliver Wendel Holmes), so that he could rationalize the bigotry and the racism the progressives gave us with the Espionage Act of 1917, and using that rationalization as an excuse to imprison anti-war protestors for disagreeing with them. (The Espionage Act makes the Patriot act look like something the ACLU wrote). Most people that use that quote, don't remember the context around it, because if they did, they wouldn't be using it. Which goes to tell you how much the smartest Constitutional Law professor, ever, knows about the cases he's citing. In the real world, we already have more laws/restrictions “constraints" against the 2nd, to the tune of 30,000+ gun laws/regulations — far more than we ever will against speech (I hope). So we’re not debating a common-sense standard of just one gun law that will make things better. We’re discussing whether we need 30,000+5 or 6 more gun regulations to fix what 30,000 would not. Even when none of those laws would address any of the mass shootings that he's whining about. Not every new constraint is a good one, and pretending that those opposing him are against ANY constraints, or against reasonable protection as basic as "fire in a crowded theater” is dishonest at best.
" A majority of gun owners agree that we can respect the Second Amendment while keeping an irresponsible, law-breaking feud from inflicting harm on a massive scale." Yes, gun owners believe that, they just don't believe the regulations he's proposing will do anything to stop/slow that. He's misleading people that even gun owners agree with him, and the gross majority polled regularly do not (with these "cures"). Most of us don't like being lectured to by hypocrites with armed guards, who want to make legislation that harasses law abiding gun owners for the actions of few criminals, that he doesn’t want to do anything about. "[background checks are] not seen as an infringement on the Second Amendment"
Correct, they infringe on the 4th Amendment. You know the ones that says, "The right of the people to be secure in their persons, papers, and effects, against unreasonable searches and seizures, shall not be violated, and no warrants shall issue, but upon probable cause..." Isn't he supposed to know the Constitution? Heck, if they don't violate the 2nd Amendment, let's have background checks on voters, illegal immigrants, welfare recipients, those getting medical care, etc? Close the sanctuary city loophole? The left would consider all those things unnecessary intrusions on liberty, and definitely stretching into voter suppression (or other suppressions) and their rights. But when they do it, they pretend it's OK? And they are infringements on the 2nd as well (they suppress a liberty)... the question is whether they are tolerable infringements or not. So at best, Obama is defrauding his listeners with a mis-framing of the issue. At worst, he knows what he's talking about and flat out lying. So I'm giving him the benefit of the doubt by assuming he's only an ignorant asshat, and not a lying one. A self deluded polarizing “community organizer", that he can't help that every speech is filled with false dichotomy fallacies (either his way, or you’re an idiot/radical). "Contrary to the claims of what some gun rights proponents have suggested, this hasn’t been the first step in some slippery slope to mass confiscation... this is not a plot to take away everybody’s guns." I disagree. Not that I think he'll succeed at it. But that every step away from liberty, and passing laws to intrude on the innocents liberties IS a step towards reducing that liberty. What else would you call it? he and the democrats would do far more to take away guns, if they could (they often get caught saying so). So their intent is clear. Obama kept comparing us to Australia and the success of their gun confiscation there, while ignoring the failures and increases in crime, that it actually brought. Why do that, if your ultimate goal isn’t heading towards that ideal? To those paying attention, in one breath he’s saying he’d LIKE to follow in their footsteps — in the next he’s claiming, “why would you possibly think we want to follow in their footsteps and take your guns? This is a completely new innocent intrusion into your rights that you should welcome readily, just don't you dare do anything like this to issues we care about”. So he's not being honest. He’s either lying to us when he says he doesn’t want us to be more like Australia, or he’s lying to us now when he says he doesn’t want gun confiscation — but it can’t be both. If he doesn’t want us to be worried about copying Oz (Australia), then maybe he should stop bringing it up? Or stop being surprised that when he keeps bringing it up, that because it's what he actually wants, and everything else is just baby steps towards his utopia. But the argument most make against his laws aren't just about the slippery slope towards his ultimate goals, it's that these laws are usually an ineffective annoyances. There are virtually NO (zero) criminals stopped from getting a gun through these means. At best, a few dozen a year might be slowed down, and have to get their guns through the readily available black market. But you can't stop mass shooters in places that have absolute gun bans, so what makes you think a little regulation like this could stop it here? It does nothing. NOTHING! Except annoy many legal gun owners, who are harassed by these regulations that fail to stop real criminals. There are fees and delays, there is the criminalization of the parent that gifts or loans a gun to their child or spouse (or other family member). So these laws don’t stop the criminals, but they make the otherwise law abiding into criminals. So the complaint is, “if you have a bad law, that isn't enforced well, and that doesn't work, and annoys the innocent, and gives the potential for abuse and corruption”, what should we do? Expand the bad laws, or repeal and fix them? (Focus on something else?) He's for the former, civil libertarians are for the latter. "The problem is some gun sellers have been operating under a different set of rules. A violent felon can buy the exact same weapon over the Internet with no background check, no questions asked." 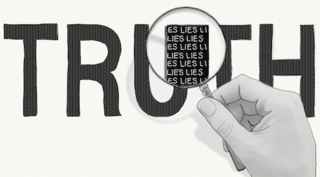 If the truth is on your side, then you don't have to lie. Someday, it's going to be on Obama's side. Today is not that day. Tomorrow isn't looking good either. Even Liberal-Leaning Politifact begrudgingly admitted it wasn't completely true. Which is the closest they come to objectivity. It was funny watching the exchanges of people wondering how Politifact could spin this one (and then laughing at their yoga poses to try to weasel out of calling the President a pants-on-fire liar). What you can do, is advertise a gun, and if someone lives near you, make an arrangement to meet face-to-face and sell them that gun, under the table, which is violating the law in many states. You can do the same exact thing for prostitution, drug deals, and even hiring a hitman — but no one honest would claim that it’s a “prostitution/hitman loophole”. You can advertise those services in Newspapers, bulletin boards, leaving flyers around, word of mouth with your friends — but it’s still illegal to advertise for illegal activity (which is also illegal). So what is another regulation going to do, but make it double-secret illegal, because the first 5 classes of laws you’re breaking by doing this activity aren’t illegal enough? This is the same as saying there's no law against selling fakeID's on the Internet. True, but there's a law against buying/selling fake ID's in the first place, the Internet didn't change anything. So they're not "operating under a different set of rules", these are the same rules. And there are hundreds of laws around dealing with guns, that apply on the Internet or not. FactChecker (by far-left WaPo) admitted [it was worthy of 2 Pinocchio's], which means it would have been worthy of 4 Pinocchio's if a Republican has said it. "There is nothing unique about the Internet; the laws governing private transactions and interstate sales are exactly the same... Obama erred in saying the rules are different for Internet sellers. They face the same rules as other sellers — rules that the administration now says it will enforce better." What PolitFact ignored is that this isn't the first time he made these fallacious claims, so the lie can't be a slip of the tongue, or something he can feign ignorance on -- since he's been tone deaf to the corrections for 8 years, so far. How many times do you have to repeat the same lie before FactChecker admits that it was more than just accidentally “misleading” of 2 Pinocchio’s and worthy of outright deception that 4 would mean? But PolitiFact admits one of many studies that shows how very few are ever transacted this way (<3%), and of those, the gross majority are legal sales. You'd have to align up 2 criminals (a buyer and a seller) that are both willing to violate the law, before there would be an illegal transaction. Virtually all the mass shooters (who bought their guns) passed background checks. So a law requiring background checks in edge cases that no one used, wouldn't have made a difference. A couple of the mass shooters (Dylann Roof, John Houser), that bought their guns, shouldn't have gotten past the background checks, but that shows the incompetence of government failing to do it's job, not the need for more laws. No mass shooter has ever gotten a gun through the "internet loophole" that Obama, the Media and Democrats distract their base about. (This "loophole" is called "meeting people on a social network, then agreeing to a black market face-to-face transaction, which is already a crime"). And it gets worse for Obama's arguments -- less than 0.7% of all criminals get their guns through the "Gun show loophole" that administration whines about. (People meeting at a gun-show and agreeing to do a parking-lot, or home exchange sale). The parking-lot exchange being against the rules of almost every gun show. Logic implies that the Internet Loophole would be much less frequent than the better anonymity and less electronic traceability of a gun-show. Frankly, I got bored going through all the frauds and lies in his speech. That's about 25% through it, and the rest goes off on silliness that has nothing to do with the mass shooting epidemic fed by daft speeches and free TV time. And his do-nothing proposals were mostly yawn-worthy, unless there's some overreach (something he's known for). This is something he could have done on day-1 and no one cares about. In fact, it goes back to the Brady bill in 1994 that gave us the promise that background checks would be point-of-sale (and not require long waits). Gun-controllers have failed to deliver on that one for 22 years. The fact that they'll now to try to do it, isn't something that bugs most gun owners — just the lies he’ll use to justify finally doing it. Now that's novel. Gun rights folks have been saying that all along too. A little better reporting on the laws we have isn't likely to help anything (since most of the guns by mass shooters are legally gotten), but it isn't going to hurt anything either. So it won't do anything but convince the gullible that Obama cares enough to do something 7 years in, that he could have done on day-1 if he really cared. again, gun rights folks have been saying that for 30+ years. Most of the mass shooters seem to have, "taking anti-depressents". The gun-suicide correlation is a fraud, and annoying. And his misleading comments about how ACA brought mental health treatment to the masses (when it was covered under almost all insurance already) is misleading at best. But good for him -- address something 7+ years into his administration that you could have done on day-1. But I'd ask, if this is so important, why didn’t you do this earlier? "safe guns" have been proposed and supported by the ignorant for 20+ years. The problem is nobody wants or would use them. These guns have existed for a decade or so, and no police force, military, or home shooter wants them -- which is why they never sold. Heck, if he wants to lead by example, I'd say fine -- arm the secret service with them, and we'll go from there. (Others will probably start collecting them at that point, for comedic effect -- take them to the range and show your friends how poorly they work in real-life situations -- when seconds count, a dead battery only takes a few minutes to change). The man is incapable of representing any topic in an intelligent and informed way (without misrepresenting the other side and the facts). Which is good enough for Democrats, but annoys the crap out of everyone else. He blathered about how he taught constitutional law, but not how he's had more Supreme Court Unanimous decisions against him than any other President (including FDR who had 4 terms in office, for goodness sake). The amount of dumb-fuckery in his speeches makes Carter look like a competent President. Even the AP (short for Administration's Press: when a Democrat is in office) admits it would have never made a difference in any of the cases offered. Summary: So to stop mass shootings, the President does nothing, but pretend to close an imaginary loophole (called the black market), by harassing the white market with some theoretical regulations that won't make a difference. He broke-wind about safe-guns that no one cares about, or will use or buy. And he cried crocodile tears that either demonstrated his hypocrisy, or the gullibility of those that bought his ridiculous gesture. This page was last edited on 19 January 2019, at 16:57.